Within this tutorial we will take advantage of Xamarin's ability to share code between different projects and platforms. Therefore you will create a Xamarin. 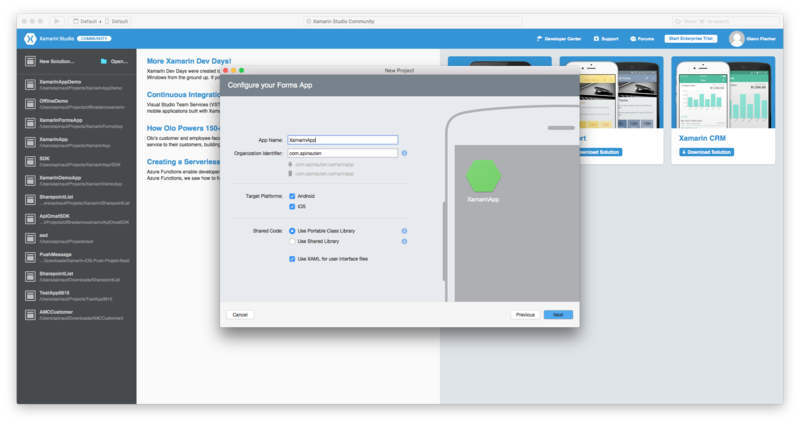 Forms app that uses a Portable Class Library (PCL) which contains the generated ApiOmat Xamarin SDK. In the next step select the desired target platforms and make sure the option Use Portable Class Library is selected. By clicking Next and Create afterwards, your solution will be created immediately. 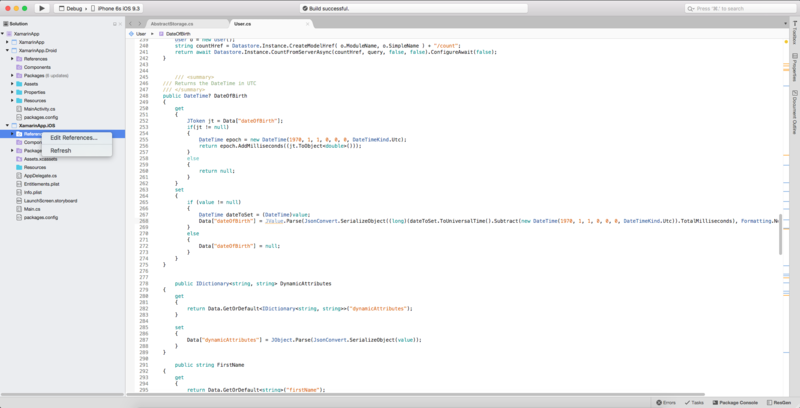 The XamarinApp project is the PCL, where you will add the generated SDK. But before you do so, you need to configure it. You cannot add Windows Phone 8.0 as target of the PCL, because the System.Linq.Parallel namespace, which is used by the SDK, is not supported on that platform. This means you can't use PCL Profile 259. Instead we recommend to use PCL Profile 111. If your IDE doesn't show the profile number in the properties, you can open the .csproj file of the PCL project and see (and change) the profile there. If you are targeting Windows Phone 8 or later and no previously added package depended on it, then you also need to add Microsoft.Net.Http Version:2.2.29! Unfortunately, due to a problem with this package, GZip-Compression for outgoing and incoming requests won't be available in this case. Within the search bar you can search for the required packages. By adding version: x.x.x after the package name you can ensure that only the specific version will be listed. For each package activate the checkbox in front of the package's name. After adding all packages, simply click the Add Package button in the right corner at the bottom and all previously selected packages will be installed in a row. You will also have to accept the license agreement of some selected packages. 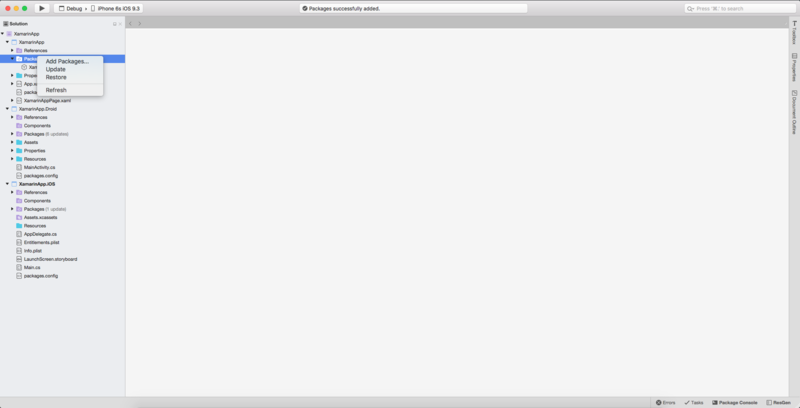 Now you are ready to add the generated SDK. Right click on your project and choose Add existing folder... Choose the Com folder of your extracted Xamarin SDK, check Include All within the appearing dialogue and confirm by clicking OK. Afterwards, chose Copy the files to directory and confirm again by clicking the OK button. 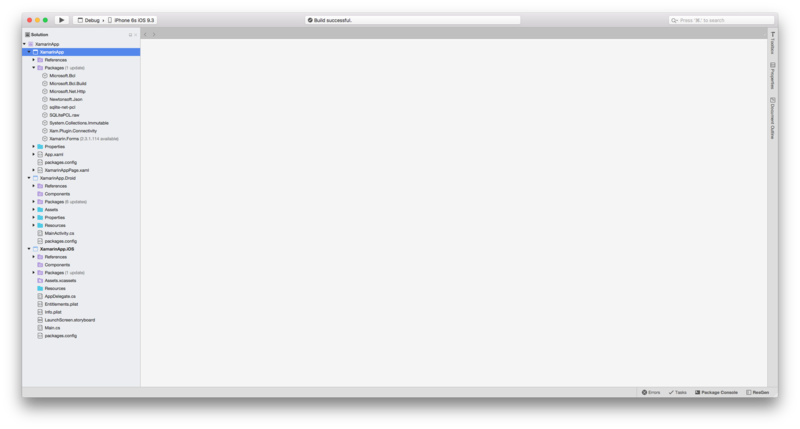 Now, to make sure everything is fine, choose Project -> Build XamarinApp. For the versions you have to use see the list above. On some Windows targets (e.g. Windows 8 store app or Windows Phone 8.1 app), the SQLite-net PCL also requires to reference the Microsoft Visual C++ Runtime Package for Windows (a System.TypeInitializationException gets thrown from SQlitePCL.raw if required and missing). 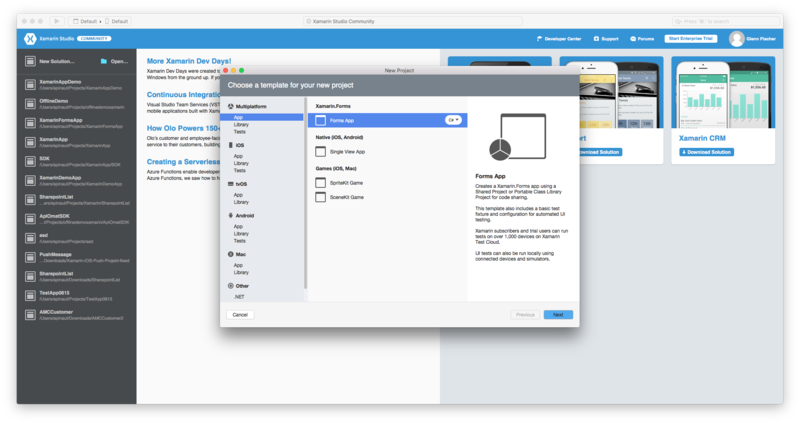 When building your target project, the Xam.Plugin. Connectivity may complain about a duplicate "Plugin.Connectivity.pdb" on your build-path. You will have to delete the file either from the folder [MyProjectFolder]/packages/Xam.Plugin.Connectivity. [Version]/lib/portable-[targets] or from MyProjectFolder/packages/Xam.Plugin.Connectivity. [Version]/lib/[target] (whereas "MyProjectFolder" is the main folder for your solution, "Version" the installed version number of the package, "targets" the different supported targets for this library, as of writing "net45+wp80+wp81+wpa81+win8+MonoAndroid10+MonoTouch10+Xamarin.iOS10+UAP10" and "target" your specific target for the project, e.g. win8). When choosing the tab Projects you can now select your PCL project. 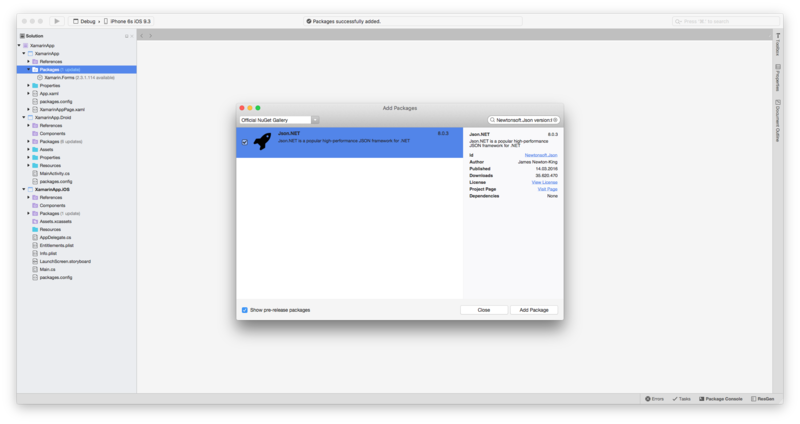 Because the ApiOmat C# / Xamarin SDK uses an SQLite database for saving requests when no connection to the server is available and for generally caching data, a few final steps are necessary to finish the setup. According to Xamarin's documentation you have to define an interface, containing a method, that provides an existing SQLiteConnection in your PCL project. Afterwards you have to implement this interface in each of your platform specific projects, as shown below. 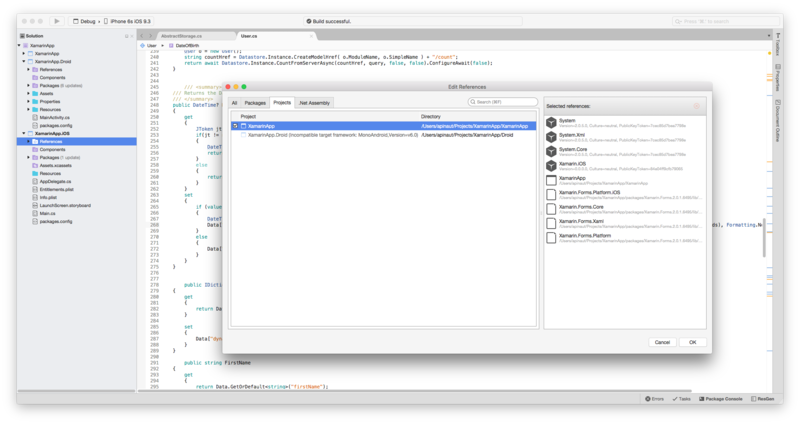 After adding those files you can initialize the Datastore with the SQLiteConnection in your Xamarin.Forms project, for example in the class that inherits from the Application class. From now on, all methods provided by the SDK, including accessing, modifying and saving your models are available within your platform specific project(s) as well as the PCL, which is also going to host your platform independent Xamarin.Forms code. Also have a look at our C# SDK documentation, where the usage of the C# / Xamarin SDK is described in detail.